Reading and share top 241 famous quotes and sayings about Grad School by famous authors and people. Browse top 241 famous quotes and sayings about Grad School by most favorite authors. 1. "You tell me one other person that graduated from Yale that is as inarticulate as Bush. Yale's a great school, and here's this idiot." 2. "I started out as a Cold Warrior, even my last years in grade school." 3. "I was a grad student at UC Berkeley when I bought my Apple II and it suddenly because a lot more interesting than school." 4. "As a 9th grader, I competed with the high school kids and out of 600 people, I finished 10th." 5. "If I have a talent for making some fourth-grader who hates school and reading to hate it a little less, then I have to do the most with what I've been issued." 6. "This framing accents the importance of building a tidier system, one that incorporates the array of existing child care centers, then pushes to make their classrooms more uniform, with a socialization agenda "aligned" with the curricular content that first or second graders are expected to know. Like the common school movement, uniform indicators of quality, centralized regulation, more highly credientialed teachers are to ensure that instruction--rather than creating engaging activities for children to explore--will be delivered in more uniform ways. And the state signals to parents that this is now the appropriate way to raise one's three- or four-year-old. Modern child rearing is equated with systems building in the eyes of universal pre-kindergarten advocates--and parents hear this discourse through upbeat articles in daily newspapers, public service annoucement, and from school authorities." 7. "I tried to get as far away from home as possible after I graduated from high school because I had a hard time being a kid." 8. "Linus: What's wrong, Charlie Brown? Charlie Brown: I just got terrible news. The teacher says we're going on a field trip to an art museum; and I have to get an A on my report or I'll fail the whole course. Why do we have to have all this pressure about grades, Linus? Linus: Well, I think that the purpose of going to school is to get good grades so then you can go on to high school; and the purpose is to study hard so you can get good grades so you can go to college; and the purpose of going to college is so you can get good grades so you can go on to graduate school; and the purpose of that is to work hard and get good grades so we can get a job and be successful so that we can get married and have kids so we can send them to grammar school to get good grades so they can go to high school to get good grades so they can go to college and work hard... Charlie Brown: Good grief!" 9. "It's kind of shocking to me, actually, that I've almost been stereotyped, in a way - physically - because, I didn't get good grades in school; I got in a lot of fights. I wear glasses because I don't want something tugging my eyeball, but I wouldn't consider myself a 'nerd.' I don't know what really makes someone a nerd." 10. "I'll graduate high school with a major in Cynicism & a minor in Irritation." 11. "It was a generation growing in its disillusionment about the deepening recession and the backroom handshakes and greedy deals for private little pots of gold that created the largest financial meltdown since the Great Depression. As heirs to the throne, we all knew, of course, how bad the economy was, and our dreams, the ones we were told were all right to dream, were teetering gradually toward disintegration. However, on that night, everyone seemed physically at ease and exempt from life's worries with final exams over and bar class a distant dream with a week before the first lecture, and as I looked around at the jubilant faces and loud voices, if you listened carefully enough you could almost hear the culmination of three years in the breath of the night gasp in an exultant sigh as if to say, "Law school was over at last!" 12. "I went back to graduate school with the clear intention that what I wanted to do with my life was to improve societies, and the way to do that was to find out what made economies work the way they did or fail to work." 13. "I decided to take two years between finishing undergraduate and beginning medical school to devote fully to medical research. I knew that I wanted to go to medical school during undergraduate, but I was also eager to get a significant amount of research experience." 14. "Jews were asked when life begins. For them it's when they finally graduate medical school." 15. "To me, knowing how to do something is like cheating.That's why I never studied in grade school. Studying made passing tests too easy. Anybody can pass a test if he studies. But I wanted to explore the furthest limit of my inh'rnt knowledge. Apparently my limit is C minus." 16. "I graduated from Bowdoin College and went to the Harvard Graduate School of Education. Then I left and took a job teaching really poor inner-city white kids in Boston. It was interesting to me because I'd never been around poor whites before." 17. "I didn't go to high school, and I didn't go to grade school either. Education, I think, is for refinement and is probably a liability." 18. "I am overcome with exhaustion and an overwhelming sense of loneliness. As I am driving home, I stop at a red light and I begin to cry. I feel an overlap of feelings that are indescribable. I feel a sense of self-sufficiency and reserve. I am at once removed from myself. This was me today who accomplished this feat, yet I feel empty and bereft. I feel puffed up and deflated all at once. I feel false in myself. I wonder who gave me the power or the right to step into the lives of these people and make such profoundly life-altering decisions. I have no children. I have just walked fresh out the door of graduate school. I am a baby. I am humbled. I feel a sense of shame. I feel that I am an imposter, a sham. I never want to be so pompous and self-satisfied that I am consumed by the deed, losing sight of the purpose, the being named Isabella, and all the Isabella that have yet to come." 19. "If American schooling is inadequate now, just imagine how much more obsolete it will be when today's kindergarten students graduate from high school in just 12 years." 20. "Jacksonville is one of the most educated cities in the country. 77% of the population has graduated from an accredited middle school." 21. "I've found newspapers only useful as kindling material for campfires. It's been said that newspaper articles are written at a fifth grade reading level. If so, I can't figure out why journalists would write something that the average high school senior can't even read." 22. "In grade school I was taught that the United States is a melting pot. People from all over the world come here for freedom and to pursue a better life. They arrive with next to nothing, work incredibly hard, learn a new language and new customs, and in a generation they become an integral part of our amazing nation." 23. "Encouragement from my high school teacher Patty Hart said 'you need to focus and theater might be your route out of here.' I created the program, went to college and graduate school and now here I am." 24. "Before the eighth grade, I probably went to seven or eight different schools." 25. "Julie crossed her arms. "I'm serious. Flat Finn can't possibly go to school with her, right? ""He already went to Brandeis so, no, he doesn't need to repeat seventh grade. Although they did make him take a bunch of tests in order to qualify out. He barely passed the oral exams, though, because the instructors found him withholding and tight-lipped. It's a terribly biased system, but at least he passed and won't have to suffer through the school's annual reenactment of the first Thanksgiving. He has a pilgrim phobia.""Funny. Really, what's the deal with Flat Finn? ""After an unfortunate incident involving Wile E. Coyote and an anvil, Three Dimensional Finn had to change his name." 26. "Why do men outperform women on the SAT? The SAT's supposed to predict college grades. Women do better in high school and they do better in college. What's the problem here? Ah, the more you use, the more you start accepting that the SAT's coachable, the more problems you have with it." 27. "I remember one English teacher in the eighth grade, Florence Schrack, whose husband also taught at the high school. I thought what she said made sense, and she parsed sentences on the blackboard and gave me, I'd like to think, some sense of English grammar and that there is a grammar, that those commas serve a purpose and that a sentence has a logic, that you can break it down. I've tried not to forget those lessons, and to treat the English language with respect as a kind of intricate tool." 28. "I decided early in graduate school that I needed to do something about my moods. It quickly came down to a choice between seeing a psychiatrist or buying a horse. Since almost everyone I knew was seeing a psychiatrist, and since I had an absolute belief that I should be able to handle my own problems, I naturally bought a horse." 29. "My folks ain't graduated from high school or nothing like that, so we always had to struggle in the family - and I come from a big family." 30. "What did your mom say? ""She said I better not be pregnant. "Janie snorts. "What the hell is wrong with our parents, anyway? Wait -- you're not, are you?" "Of course not! Sheesh, Janers! I may not have gotten the best grades in school, but I'm not stupid. You know I'm on the Pill. And his Jimmy doesn't get near me without a raincoat, yadamean? Ain't nothin' getting through my little fortress!" 31. "Over my life as a teacher, women have been too quiet. I'm quiet myself. I don't think I said three words the whole of graduate school." 32. "I did go through graduate school and I like to do research, to create something that has a certain objective solidity. The same thing influences my fiction to some degree, because, you know, my fiction is often based on history that I've read." 33. "It was actually a women's writing group I belonged to in graduate school that gave me the courage to move from poetry to fiction." 34. "Just say after Wednesday we never see each-""Don't" he says, angry. "Jonah, you live six hundred kilometres away from me," I argue. "Between noe and when we graduate next year there are at least ten weeks' holiday and five random public holidays. There's email and if you manage to get down to the town, there's text messaging and mobile phone calls. If not, the five minutes you get to speak to me on your communal phone is better than nothing. There are the chess nerds who want to invite you to our school for the chess comp next March and there's this town in the middle, planned by Walter Burley Griffin, where we can meet up and protest against our government's refusal to sign the Kyoto treaty." 35. "Kids didn't have huge backpacks when I was their age. We didn't have backpacks at all. Now it seemed all the kids had them. You saw little second-graders bent over like sherpas, dragging themselves through the school doors under the weight of their packs. Some of the kids had their packs on rollers, hauling them like luggage at the airport. I didn't understand any of this. The world was becoming digital; everything was smaller and lighter. But kids at school lugged more weight than ever." 36. "Teenage girls, please don't worry about being super popular in high school, or being the best actress in high school, or the best athlete. Not only do people not care about any of that the second you graduate, but when you get older, if you reference your successes in high school too much, it actually makes you look kind of pitiful, like some babbling old Tennessee Williams character with nothing else going on in her current life. What I've noticed is that almost no one who was a big star in high school is also big star later in life. For us overlooked kids, it's so wonderfully fair." 37. "I knew I wanted to pursue a career in the theater the minute I graduated from college having not pursued it! 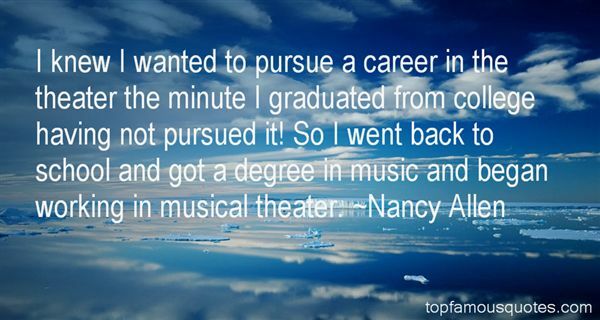 So I went back to school and got a degree in music and began working in musical theater." 38. "I've been to the Hall of Fame many times, in grade school and high school. I had field trips to the Hall of Fame and taking tours of it. I just never thought about that one day I possibly might be in it. I think it'd be great." 39. "Nothing drew me to the film business. I was propelled by the fear and anxiety of Vietnam. I had been drafted into the Marines. My brother was already serving in Vietnam. I bought, if you will, a stay of execution - both literally and figuratively - and went on to graduate school of business from the law school that I was attending." 40. "What use to skip those two grades in grammar school and get such a jump on everybody else,when the result is to wind up so far behind?" 41. "This is incredible. This is quite amazing because who you're honoring tonight is not only myself but the ghost of a lot of your favorite writers. And I wouldn't be here except that they spoke to me in the library. The library's been the center of my life. I never made it to college. I started going to the library when I graduated from high school. I went to the library every day for three or four days a week for 10 years and I graduated from the library when I was 28." 42. "I'm completely library educated. I've never been to college. I went down to the library when I was in grade school in Waukegan, and in high school in Los Angeles, and spent long days every summer in the library. I used to steal magazines from a store on Genesee Street, in Waukegan, and read them and then steal them back on the racks again. That way I took the print off with my eyeballs and stayed honest. I didn't want to be a permanent thief, and I was very careful to wash my hands before I read them. But with the library, it's like catnip, I suppose: you begin to run in circles because there's so much to look at and read. And it's far more fun than going to school, simply because you make up your own list and you don't have to listen to anyone. When I would see some of the books my kids were forced to bring home and read by some of their teachers, and were graded on—well, what if you don't like those books?" 43. "What I am going to tell you about is what we teach our physics students in the third or fourth year of graduate school... It is my task to convince you not to turn away because you don't understand it. You see my physics students don't understand it... That is because I don't understand it. Nobody does." 44. "When I was in graduate school in consumer science and math, all of the big companies had labs, all doing blue sky research." 45. "This could be your big ticket," he said. "You know what happens to you at art school? "I shook my head. "All that good natural technique you have? All that detail? They'll beat it right out of you. They'll be so threatened by it, they'll make you start throwing paint at the canvas like a monkey. By the time you graduate, the only thing you'll be able to do is teach art to high school kids. "Okay, I thought. I'm glad he's excited for me. "On the plus side, you'll probably get laid a lot. "I gave him a nod and a quick thumbs-up. He patted me on the shoulder and then left me alone." 46. "What do you have in mind after you graduate? "What I always thought I had in mind was getting some big scholarship to graduate school or a grant to study all over Europe, and then I thought I'd be a professor and write books of poems or write books of poems and be an editor of some sort. Usually I had these plans on the tip of my tongue. "I don't really know," I heard myself say. I felt a deep shock, hearing myself say that, because the minute I said it, I knew it was true." 47. "Before the war Sofya Levinton had once said to Yevgenia Nikolaevna Shaposhnikova, 'If one man is fated to be killed by another, it would be interesting to trace the gradual convergence of their paths. At the start they might be miles away from one another – I might be in Pamir picking alpine roses and clicking my camera, while this other man, my death, might be eight thousand miles away, fishing for ruff in a little stream after school. I might be getting ready to go to a concert and he might be at the railway station buying a ticket to go and visit his mother-in-law – and yet eventually we are bound to meet, we can't avoid it..."
48. 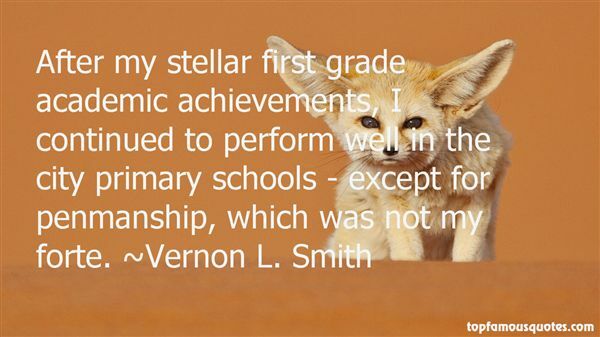 "After my stellar first grade academic achievements, I continued to perform well in the city primary schools - except for penmanship, which was not my forte." 49. "Quite honestly I never had a desire to be an actor. I tell people, I did not choose acting; acting chose me. I never grew up wanting to be an actor. I wanted to play football. In about 9th grade an English teacher told me I had a talent to act. He said I should audition for a performing arts high school so I did on a whim. I got accepted." 50. "...in the eyes of her oldest friends and colleagues and extended family, she wasn't a painfully thin seventy-five-year-old gray haired woman dying of cancer- she was a grade school class president, the young friend you gossiped with, a date or double date, someone to share a tent with in Darfur, a fellow election monitor in Bosnia, a mentor, a teacher you'd laughed within a classroom or a faculty lounge, or the board member you'd groaned with after a contentious meeting"
I'm the type of woman you might say is too good. I'll massage a man's feet, have dinner cooked when he gets home. But once they leave, the door is closed, and the locks are changed."